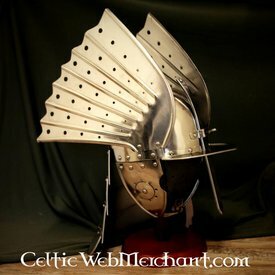 This morion is a replica of a French original. Models like this were worn from the 16th until the 17th century in whole Europe. The original is part of the collection of Musée D` Armée in Paris. This morion has sloping edges, a peak and is decorated with styled brass flowers. It can be fastened under the chin with a strap. _x000D_ This helmet is custom made, click here to download the size table.